Just days ago I was bereft. My beloved tarpon trip died and untimely death. Too soon… too soon. So hard to lose that trip. The fishing gods seemed to have insisted on a pre-payment plan, paid in karma, over the previous Florida trips with rain, rain and more rain, and no adult tarpon landed. This was going to be the year for the payoff! Alas… it was not to be. So I was adrift… slightly buoyed by the fact I’ll be in Belize next week, but still a bit bummed at the dashing of Florida dreams. But, not all is lost. The world of saltwater fly fishing, maybe even those same fishing gods, seem to give as well as take. And so it was that a new trip possibility emerged in my consciousness. I’ve managed to fish a few places, the Bahamas, Belize, Cuba and the Keys, but I have never fished the Caribbean side of Mexico. Many moons ago I used to have family (different from my current family) trips to Nuevo Vallarta and I fished from the beach there for Jacks and lookdowns and whatever else I could fool with a clouser, but I never made it over to the Yucatan with a fly rod. I really wanted to change that. If only I had some sort of guide to the fishing in the Yucatan. If only there was some sort of book that laid it all out. Oh look! 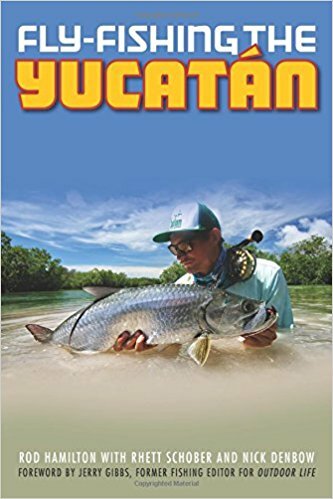 A book, a guide of sorts, to fly fishing the Yucatan. Just a couple of mouse clicks later (thanks Amazon) and I was reading said guide and getting more and more convinced this is what I should do. So… I’m going to the Yucatan. I’m going despite my almost non-existent Spanish (maybe babble.com can help there). I’m going despite not having anyone, for sure, to go with. I’m flying in July 24 and out July 29. I’m going to be staying in Mahahual, a place I honestly had not heard of until a couple days ago. I’m going to be fishing at least one day with Nick Denbow, a guide working out of Mahahual and co-author of the above book. If YOU want to come along, well, we could fish with Nick another day. I figure if we want to put a group together, we could do that, probably no more than 4 guys total though, some being guided, some DIY on alternating days. I’m excited about the trip and about seeing new water in a new area. My wife is a fluent Spanish speaker and this general area (although I hadn’t thought about going this far South before) is where I’ve been thinking we could target for future family vacations, so I’m interested in seeing what the region is like. So, let me know if you’d like to come along. Could be fun. I’m perfectly fine to do this trip solo… that way I get all the delicious water to myself, but, ya know, always good to share the experience (and cost). This entry was posted on Sunday, April 9th, 2017 at 7:23 am	and is filed under Locations. You can follow any comments to this entry through the RSS 2.0 feed. You can leave a comment, or trackback from your own site. Good for you, man! Wish I could join you. Me too man. Me too. Will almost certainly catch more tarpon here than we would have in the Keys… they’ll just be smaller.